Last week we had a special dinner date, a very special dinner date indeed. 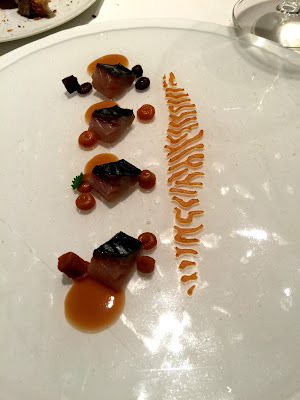 All the planets aligned and we were offered a table at the celebrated Celler de Can Roca in Girona. We've been trying to get a reservation there for ages. Normally you have to book 11 months in advance. Yes, that's right. Almost a full year ahead of when you want to go out for dinner. Mr B has been trying each month, on the first day of the month, when they open the bookings for 11 months down the line, to wrangle a table. But here's the thing: they open the booking line at midnight on the allocated date, and within ten minutes all the tables for the entire month on offer are gone. As we knew we were going to be on the Costa Brava for all of August we put our names down for a cancellation - any cancellation. And last week, when our besties, P and A were in town, we lucked out with a table for four. 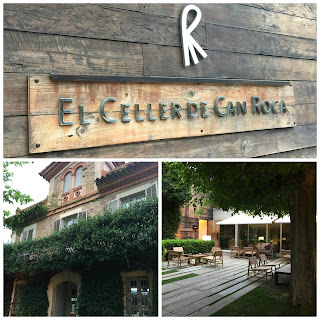 So what's so special about this Celler de Can Roca? you may well ask. 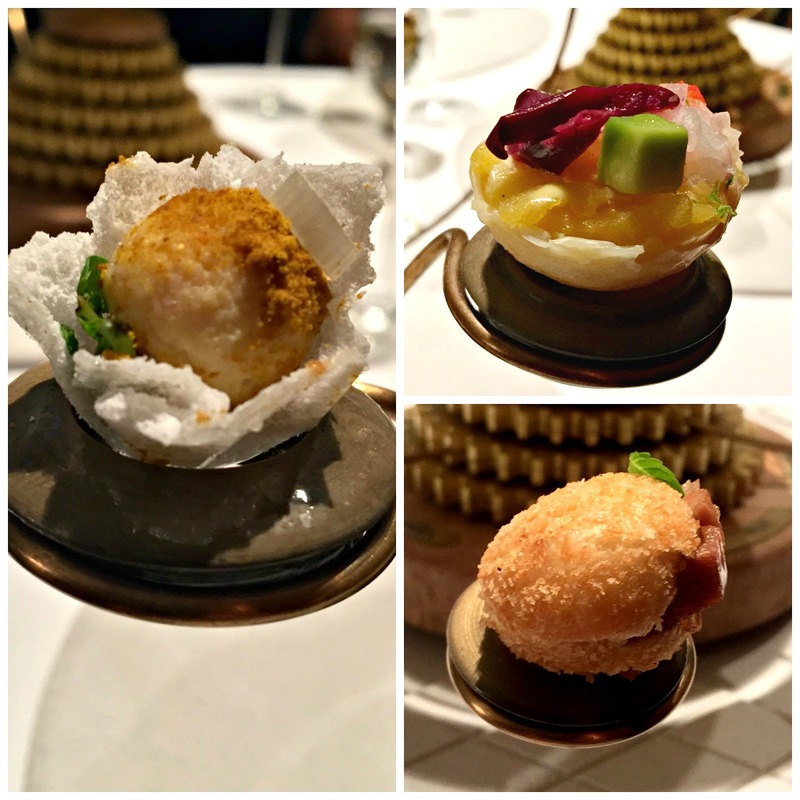 Well, they've got 3 Michelin Stars for starters, and if you check out the World's 50 Best Restaurants you'll see that they're up there - right up there at the very top. In 2013 Celler de Can Roca was voted the world's Number 1 restaurant, in 2014 it fell to number 2, 2015 saw it return to the number 1 spot, in 2016 it was number 2 and this year, 2017, it's number 3. In anyone's gastronomy it's a very special eatery. 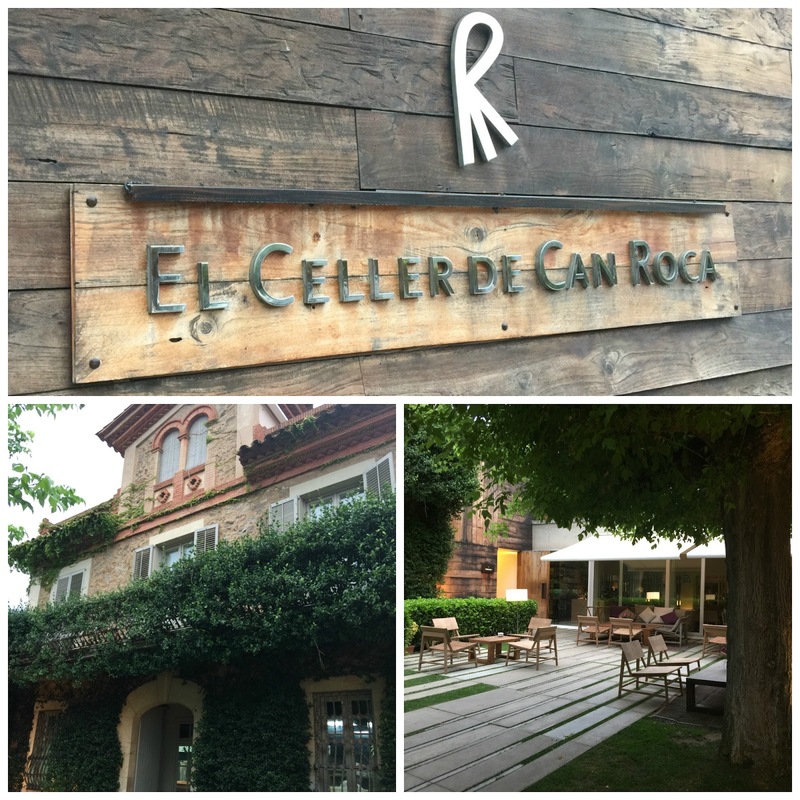 And here's the great thing about Celler de Can Roca: it's a really easy-going place. You can relax and chill out. It's just about the most unpretentious restaurant you could ever hope to visit. In the first instance it's in a totally normal, run-of-the-mill residential street on the outskirts of Girona. This high temple of gastronomy sits, almost incognito, amidst the everyday hum-drum of suburbia. But for a discrete sign on the wall you wouldn't know it was there. 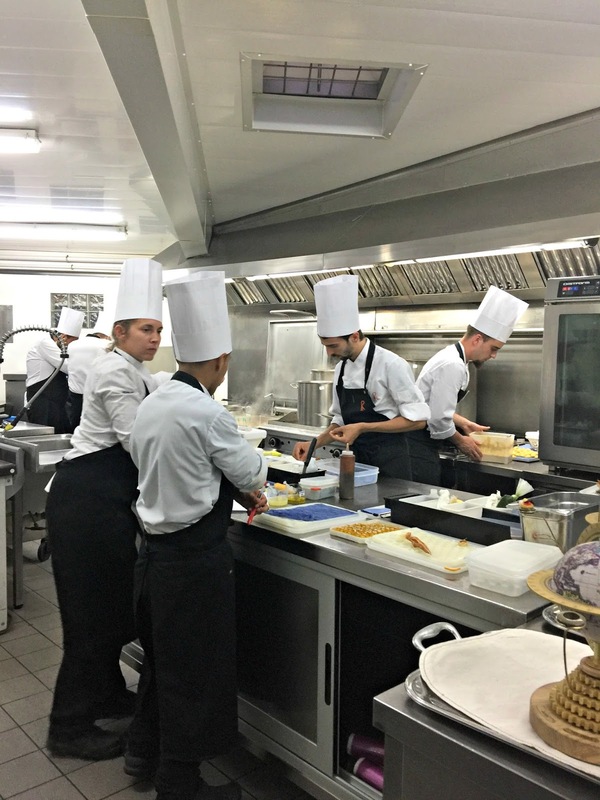 Inside you're welcomed by a young and enthusiastic staff, who are operating - every last one of them - at the very top of their game. When we arrived and expressed an interest in seeing around the backstage area we were, without any hesitation, offered a tour of the cellar and the kitchens. Not a single soul in any part of the entire establishment was anything other than charming, helpful and super enthusiastic about what they were doing. They often say that if you follow your heart, and do a job you love, you'll never work another day in your life. 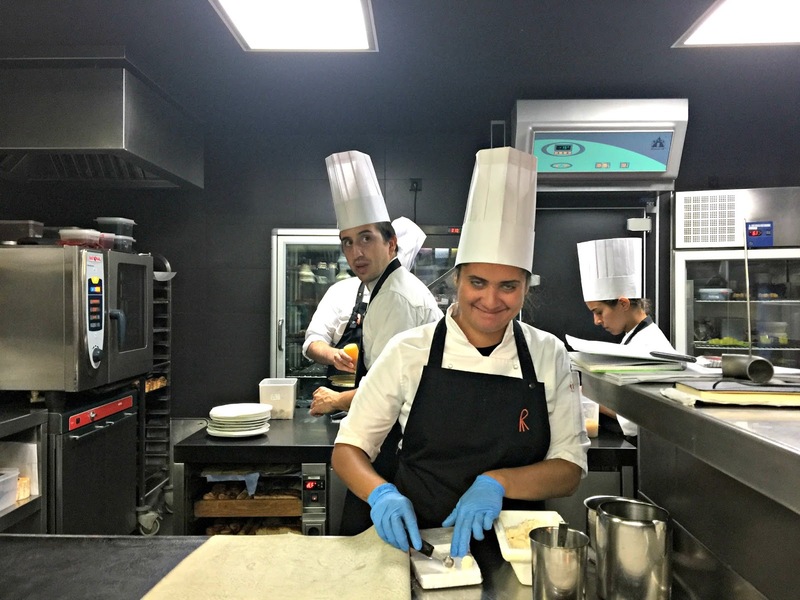 I'd wager that the workforce at Can Roca can vouch for the wisdom of that philosophy: there wasn't a glum face to be seen anywhere in the house. El Celler de Can Roca is a family affair. It was the brainchild of three brothers who grew up right here in this very suburb. Their family opened a bar, called El Bar de Can Roca way back in 1967. The Nestlé factory opened close by soon afterwards. Then they started building bridges on the motorway that by-passes Girona to link Barcelona with France. Between the factory and the road-building there were lots of hungry folk who needed feeding on a regular basis. To meet that demand the bar began to offer typical Catalan food: chicken with langoustines, pig's trotters with turnips, cod with raisins and battered squid. The word went around, and soon they were packing them in. Three little boys, the Roca brothers, grew up playing in the kitchen out the back, absorbing the richness of Catalonia's traditional cuisine. From here Joan, Josep and Jordi started out on their own journey to the top of the world with their restaurant, El Celler de Can Roca, named in honour of their parents' old bar. 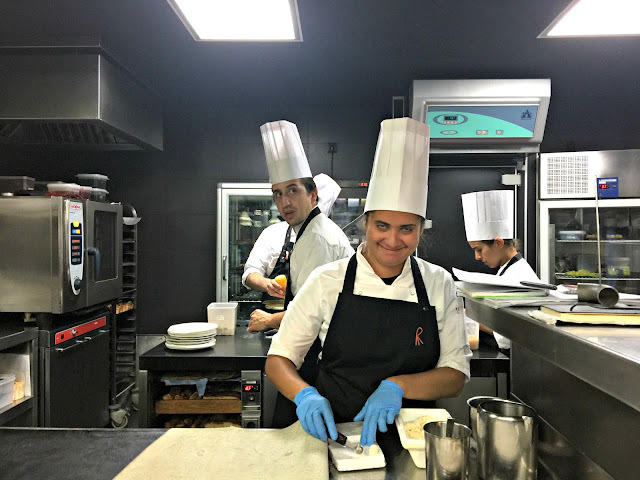 Joan, the eldest, is the head chef, having learnt the craft from his mother and his grandmother, Josep is the head sommelier, is charge of their inspiring cellar of 50,000+ bottles and Jordi, the youngest brother, is the head pâtissier. 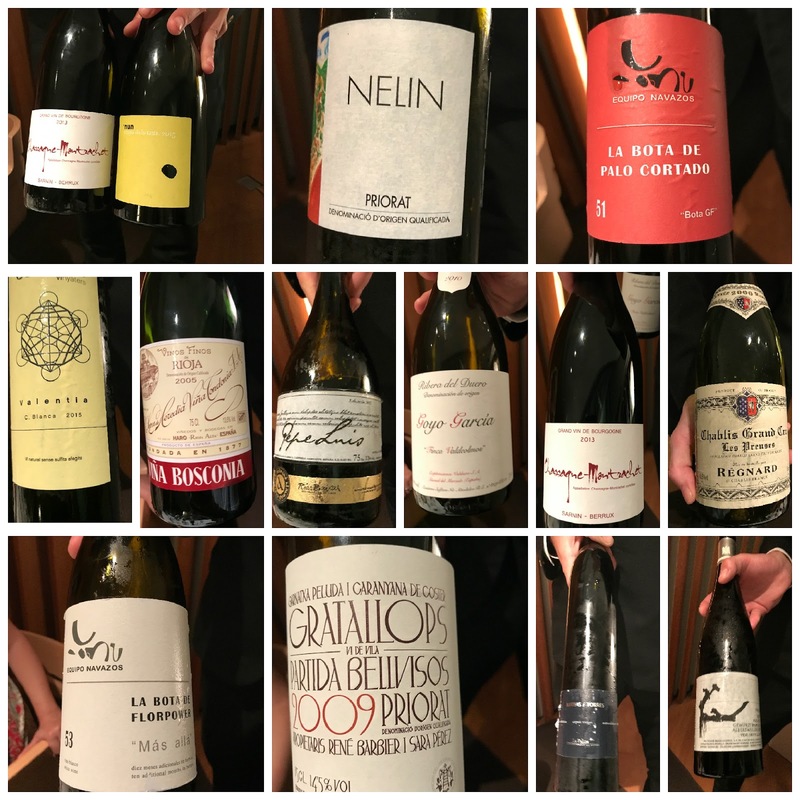 Seeing as it had been so difficult to get a reservation we decided to go the whole hog and order the Feast Menu with accompanying wines chosen by Josep to compliment the food. Now let's be very clear from the outset: this was no minor undertaking. This was something of a round-the-world trip that would take us to all of the gastronomic compass points and back again. The Feast Menu comprised 20 odd courses - including some very elegant amuse-bouche and dessert courses, and, even though they served small measures of accompanying wine with each dish, it all added up to quite a few calories and more units of alcohol than we could have legally driven home with before breakfast the following day. 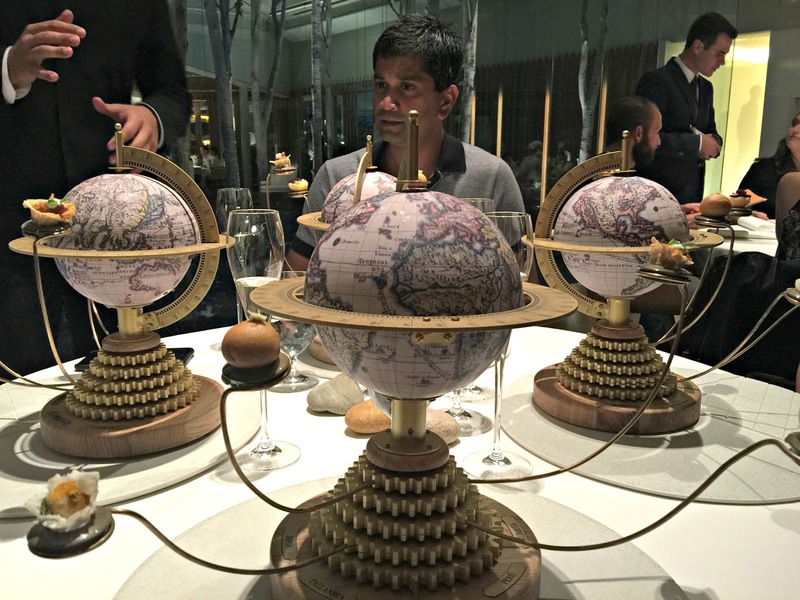 The very first course comprised a quintet of amuse-bouche from around the world, served on these amazing globes. The challenge was to place the arm bearing each morsel on the line of longitude that corresponded to the country of its origin. 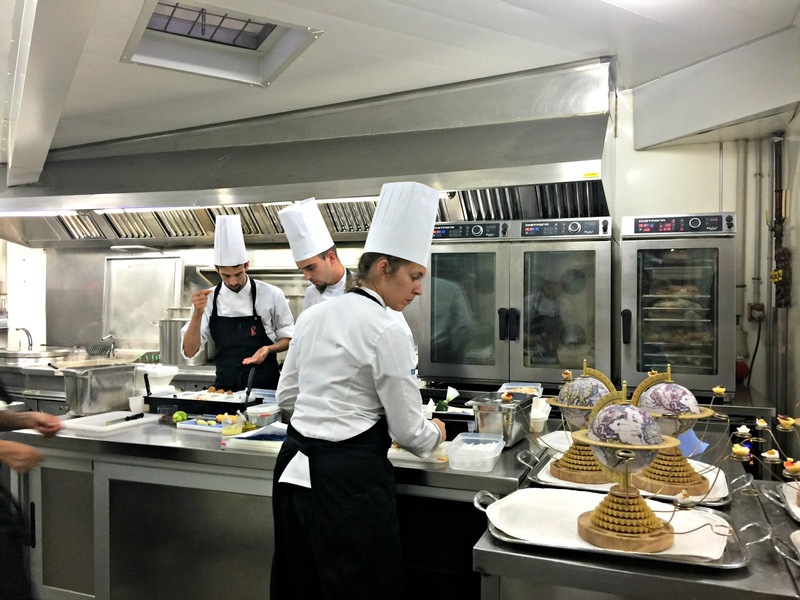 We had fragrant Thai chicken, delicately dressed with coconut and lime, succulent Turkish lamb with a soupçon of yoghurt and mint, fried bread with bacon in a soy, kimchi and sesame oil dressing from Korea and Ningyo-yaki cakes with a delicate miso cream from Japan. Once we'd got all of these gastronomies pinned down to their proper lines on the globe a secret compartment on top was unlocked to reveal a Causa Limeña, which looked to me like a gelatinous bonbon made out of caviar. OK, I'll 'fess up: I don't truly know what it was, but it tasted salty and delicious. I'm really glad they gave us this quiz course at the beginning of the meal. I think we'd have all been struggling to get to that mysterious Causa Limeña after enjoying the wines. To the best of my recollection (!!!) 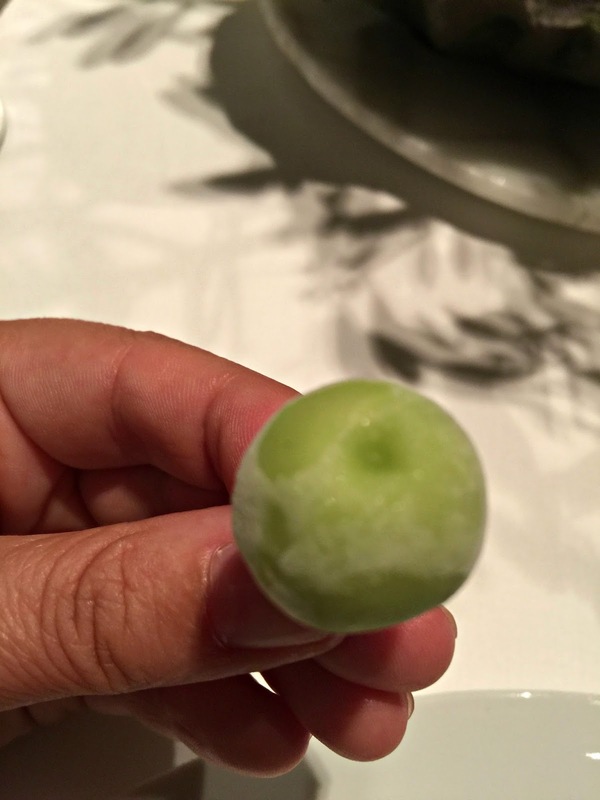 we quaffed a bone dry Penedès and a crisp Cava with this part of the meal. The red ball on the front left is a Campari bonbon - verdict: amazeballs! I'm always up for a nice Campari 'n soda as a sun-downer after a day on the beach, and this one, though modest in quantity, was sensational. 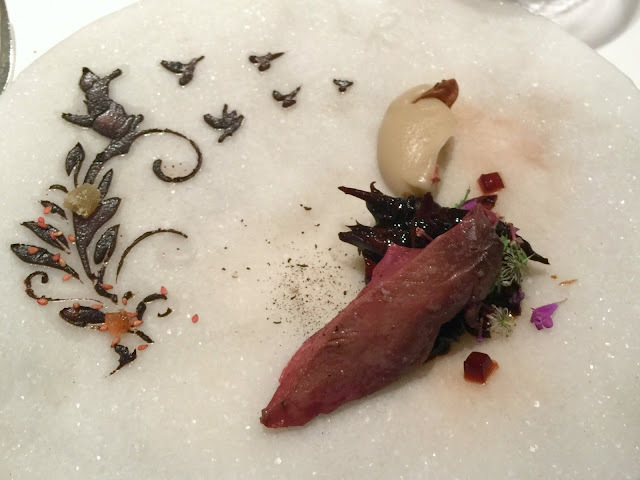 Beside the Campari bonbon is a savoury pigeon bonbon. Behind, working from left to right we had breaded squid, a mini breadstick with sausage and Montse's meat cannelloni. The three brothers are also lurking around the bar as cardboard cut-outs. I think it's Joan, front right with bad-boy, Jordi on his bike behind. Josep is in there somewhere, but he appears to have shied away from the camera for this shot. 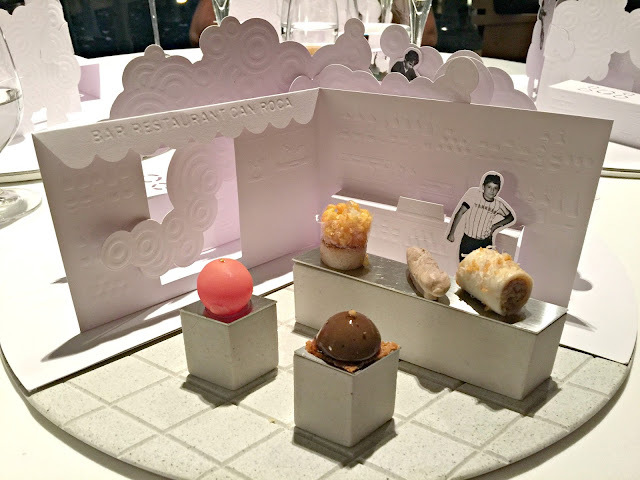 For me, this amuse-bouche summed up the spirit of Can Roca: quirky, playful and firmly in touch with its roots. One of the courses that got our unanimous thumb's-up for best-in-show was the green olive ice-cream. I have to say that, as the courses kept coming and the wine kept pouring, there were a (large) number of unanimous thumb's-up for best-in-show commendations, but please bear with us as El Celler de Can Roca is guaranteed to drain anyone's vocabulary of acclamations. 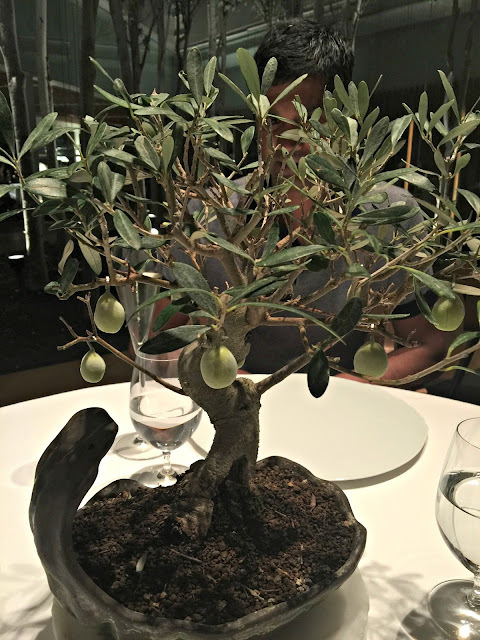 The green olive ice-cream came attached to its own perfectly-formed bonsai olive tree. And, hanging there on the branches, the ice-creams really did look like a perfect crop of chilled green olives - the only thing giving them away was the dewy condensation misting the skin of these exquisitely crafted doppelgängers. They've got a playful habit of challenging your preconceptions here. I mean who'd have expected ice-cream in green olive flavour or a savoury bonbon that tasted of pigeon? Or who would have expected the combinations of flavour and texture in the green chickpea hummus that came shortly afterwards? The hummus was powdered like a spice or a garnish on the side: a familiar taste in an unfamiliar setting and form. Somewhere around the early part of the meal they served the most beautiful Vino de Jerez by Equipo Navazos La Bota de Flor Power. If, like me, you enjoy bone-dry whites you'll adore this one. It isn't fortified, and is light, crisp and clean on the palette with a short sherry after-taste: the perfect wine for a summer evening. You simply can't come to this part of the world and not try the legendary prawns from Palamós. Up in Palamós they fish the most amazingly tasty prawns. They are rightly famous for their firm-texture, famous red colouring and strong flavour, and they're at their best in summer. In the kitchen the prawns were marinated in rice vinegar and served, with their extremities crisped to create an uber prawn flavour, in a seaweed velouté. In the world of colour and textiles I'm a great fan of ombré-toning, where they take a colour and lighten or darken it to produce a gradation of colour-intensity. 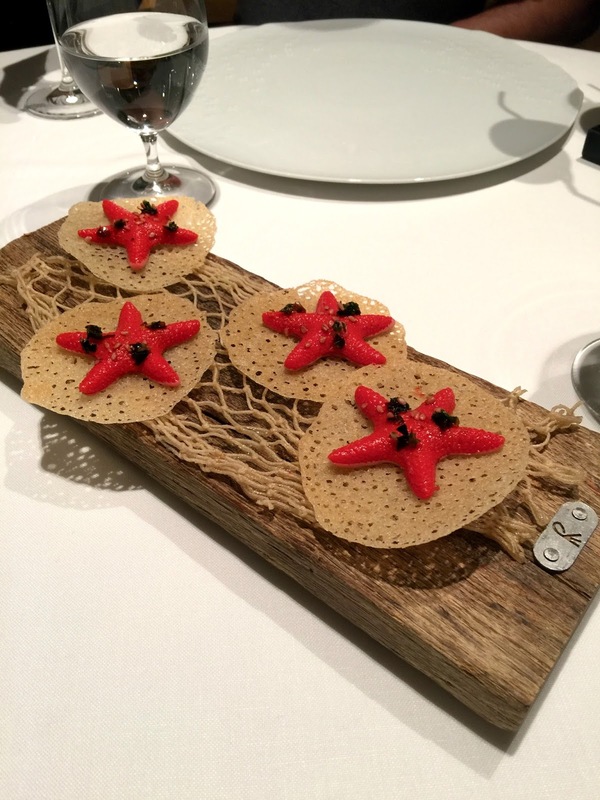 Here at Can Roca they do the same thing with flavours. 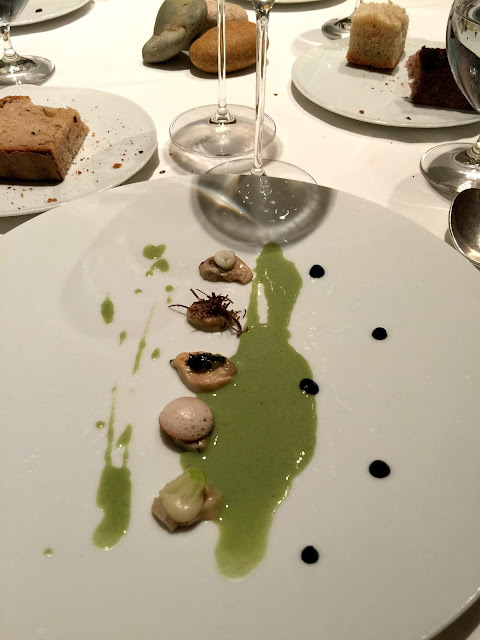 An oyster was painstakingly sliced into thin fillets, which were served in a fennel sauce with a range of accompaniments of increasing bite: an ombré of intensifying flavours. We had an amazing Mackerel course served with another ombré of fermented ganxet beans, a delicious staple of Catalan cuisine. 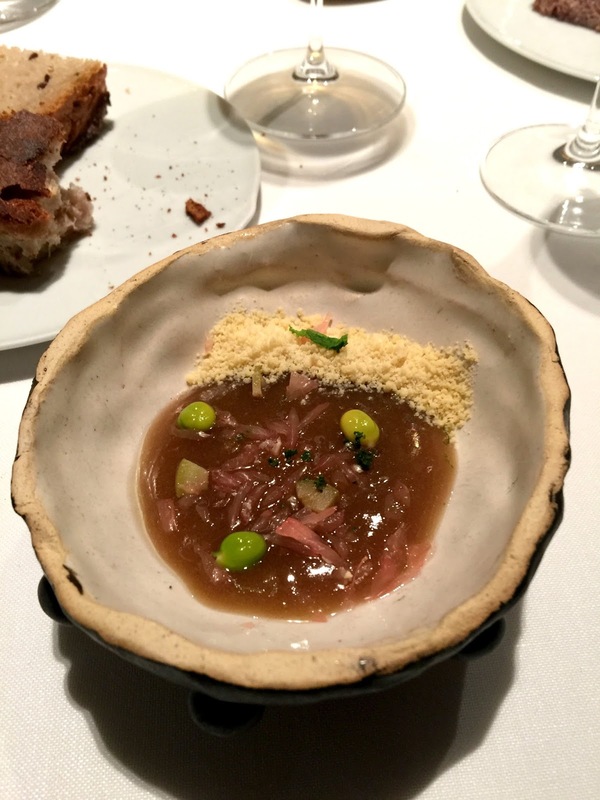 The mackerel was served in small mouthfuls with increasingly more fermented bean garnish as the diner worked her way up the plate. We all agreed that the langoustine served with a delicate sage, vanilla oil and roasted butter sauce was a triumph that was too good to take a time-out to photograph. 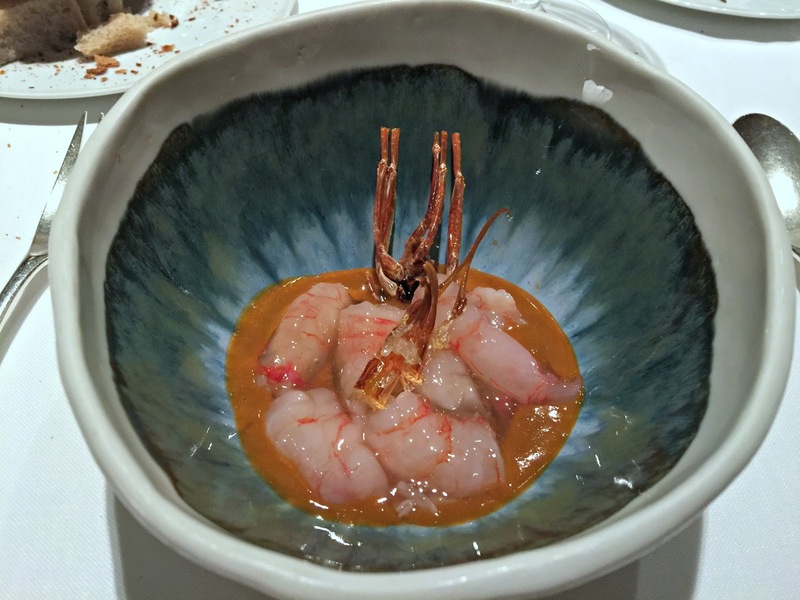 The flesh of the langoustine was succulent and firm and the sauce, sweetly delicate: a perfect accompaniment. Simply put: it was divine. At the end of the fish courses we had a beautifully presented fillet of duck breast. This was served on a bed of cooked cherries, which provided a perfect note of sweetness that brought out the rich earthiness of the duck. One of my favourite courses was the suckling pig, topped with perfect crackling, and served with an exotic salad of green papaya, grapefruit, coriander, chilli and lime. 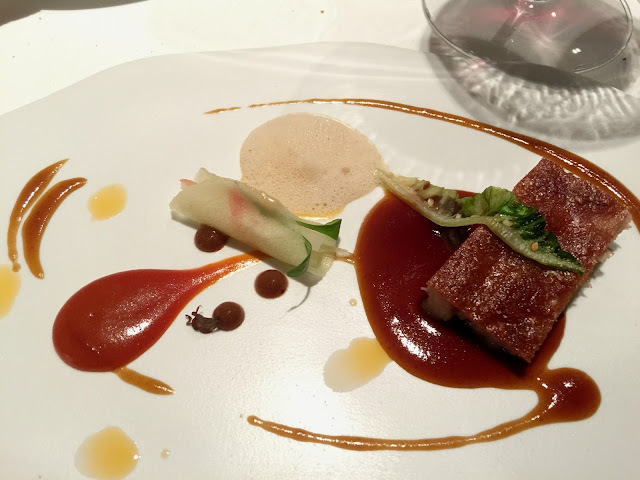 The combination of the tart and sweet flavours from the salad was superb with the pork. One of our friends, who does not eat pork, was given an extra fish course before his duck to compensate. 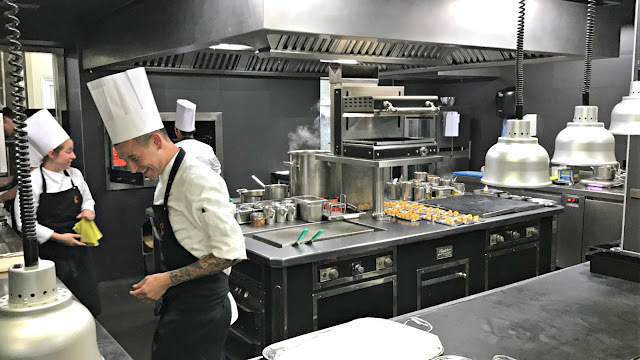 The waiters were sensitive to his dietary requirements, and juggled the other courses, so that his meal followed a smooth trajectory from fish to fowl to meat. Normally I'm not a dessert person. I don't have a sweet palate, and will happily forego all the puddings on offer. 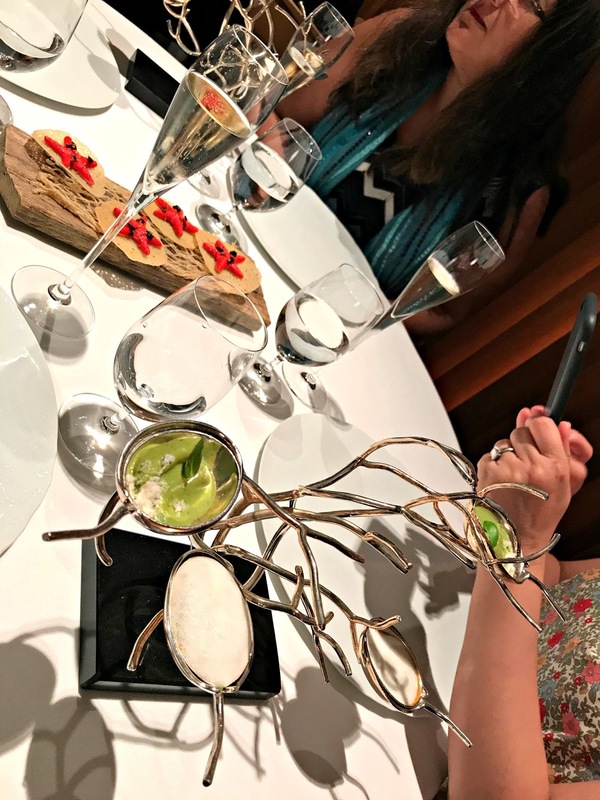 But, here at Can Roca, there were two desserts that stood out for me. The first was inspired by the fragrance, Miracle, by Lancôme. It came with a little paper cone on which the fragrance had been sprayed. The flowery notes of the fragrance were echoed in the sorbet of lychees, rose, violets and pink pepper. It was a light, fragrant delight for all the senses. 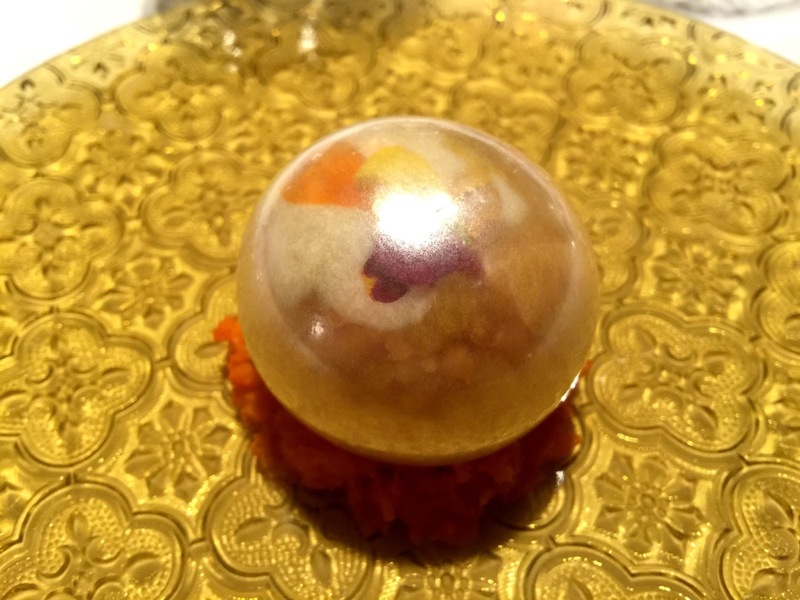 Our next dessert looked like a beautiful Christmas tree bauble. Have you ever been presented with a cake that you felt was just too pretty to eat? Well that's exactly what happened here. I looked at my plate, and really had to harden my heart to break open such a pretty thing. But it was worth the struggle. 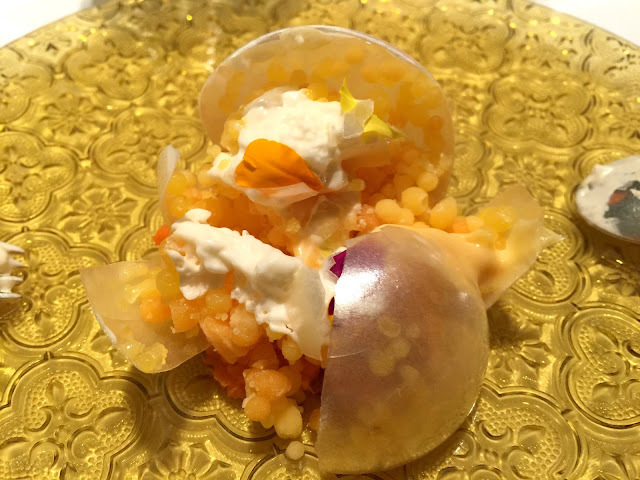 Served on a bed of grapefruit granita, it was a homage to all things orange. Inside little pearls of clementine sorbet and ginger cream were mixed with delicate orange nasturtium petals. Exquisite! A dream dessert. These two desserts were spectacular for me because the emphasis was on fruit and fragrance rather than creamy sweetness. They were light and perfectly bookended a delightful dinner. 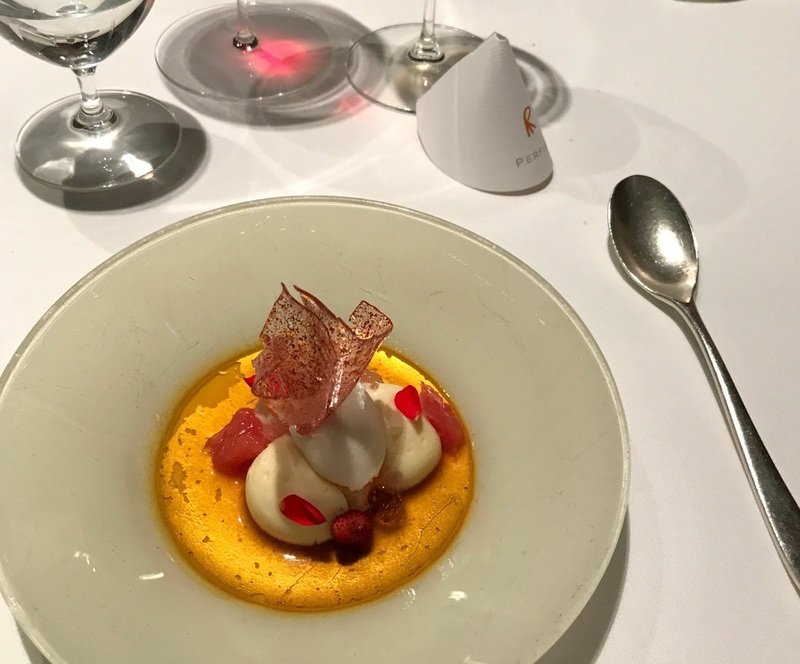 At about this point in the evening we were served a wonderful chilled Matias y Torres 12 Malvasia dessert wine from the Canary Islands with a lightness and fragrance that perfectly complimented the delicate notes of the desserts. If you'd like to take your chances at getting a reservation with the Celler de Can Roca, you can find them here: El Celler de Can Roca. If you're in the area, you'd be crazy not to try. I cannot imagine eating in a place like this..but I would sure like to experience the food! So glad you got to go till you could tell us about it. 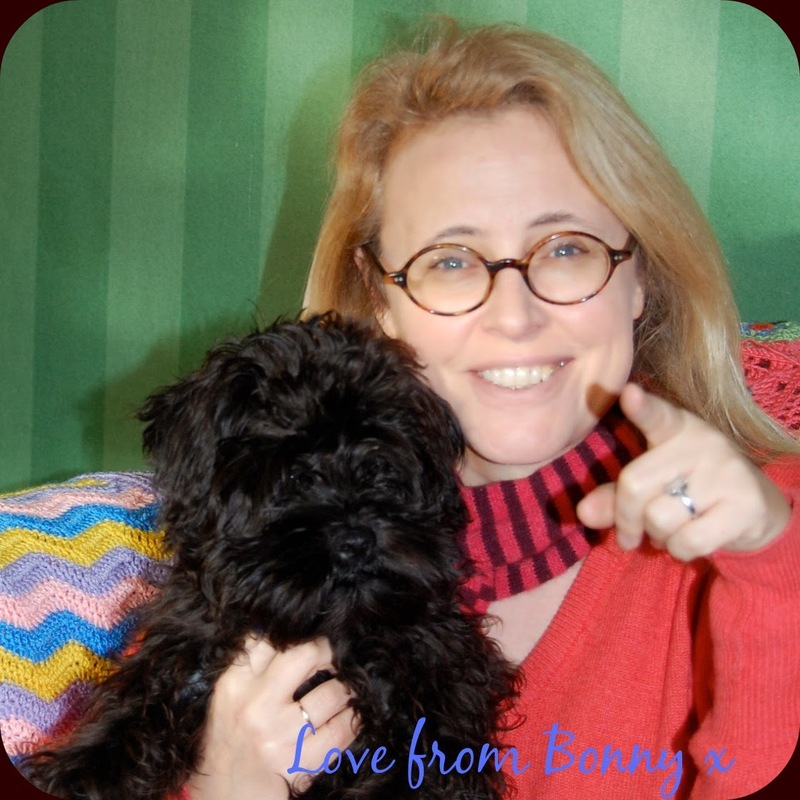 I am sure it's a great place, Bonny. 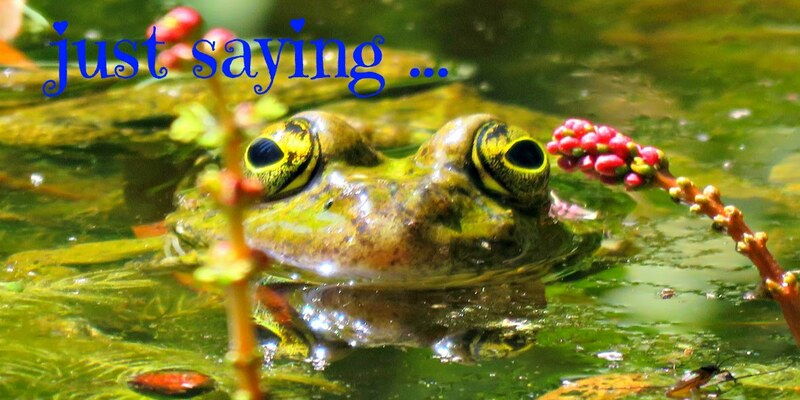 Thank you for sharing with your international friends. Kisses from Greece, my friend. My gosh that is a long time to wait to eat there. - I'm happy you were able to get in and I do hope the food was worth the wait.